One of the most fragranced of all the night phloxes. One of the most fragrant evening-scented plants. Covered in a myriad of highly fragranced blooms all summer. Sparkling white pinwheel-flowers cover the compact mound of foliage. Perfect in a pot on the patio. With highly fragranced blooms that open through the summer, the buds of the scented night phlox emerge like little match sticks over the plant before bursting into a myriad of shining pinwheels. 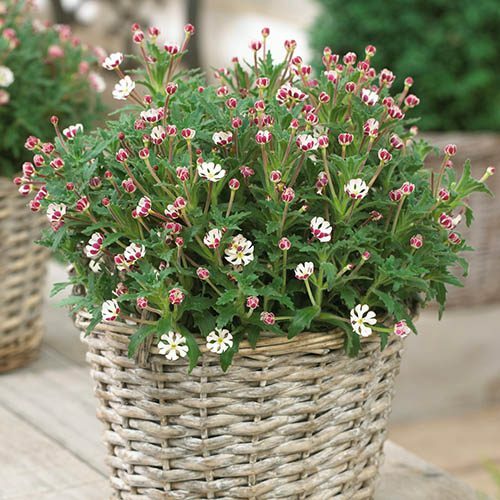 An easy-to-grow, compact plant, the scented night phlox forms a neat mound of aromatic, evergreen foliage topped with an abundance of petite buds which open in the evening to reveal the sparkling white flowers and their fabulous honey-vanilla scent. Flowers close in the heat of the day and in the evening they unfurl releasing their intoxicating perfume! Night-scented plants are common, but the overwhelming sweet fragrance of Zaluzianskya is one of the best! To really appreciate Night Phlox, plant up into your favourite container and add to tables when alfresco dining. Supplied as an established plant in a 2L pot, ready for immediate planting out. Plants dislike being wet and cold, so water sparingly over winter and protect from frost. Zaluzianskya ovata needs a fertile soil that is moist during the summer but well-drained in winter. Best grown in pots as it is not reliably hardy except in mild areas or warm, sheltered spots. Cut back hard immediately after flowering has finished. Don't let the pots dry out in summer as this will make the stems of the plant become woody.